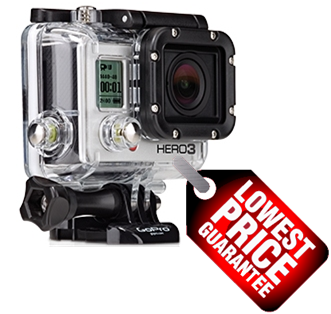 If you live outside of USA, let's say in Europe, you're probably wondering why the hell is the GoPro HD camera more expensive in your country?! And not just the GoPro. All tech gear for that matter: DSLRs, point and shoot cameras, smartphones, iPads, laptops and what not. They're all made in China anyway so what's with this price difference?! I guess we can agree that there's a difference between $299 and €299, can't we? For some reason it seems that GoPro doesn't care that a client from UK or Germany will actually pay more for the same camera (bought locally). That's unfair, don't you think? Why couldn't they set a national distributor in each country and import the cams from China? Then they could price the cams the same as in USA, converting the price from US dollars into the local currency. So what do you do if you want the best price? But if the product has just been launched in USA, it'll take a while to reach the European market. And you don't wanna wait. I know, I don't like to wait either. I did this several times and never paid taxes. We bought snowshoes, a smart Echo pen (transforms your handwritten text into searchable PDFs; also records audio), an iPad keyboard. I also received some gear sponsorships this way (hydration pack and portable solar panel). The only time I paid taxes was when I bought the GoPro HD (first version) - it was still cheaper than buying it from Europe at that time (January 2010). After that I figured a way to trick the system. Read on. Usually when something comes from outside EU you have to pay VAT as custom tax. So if the VAT in your country is say 24%, you have to pay 24% on top of the invoice that's inside the box. You'll probably hate that. I order the items from Amazon.com and have them shipped for free at someone who lives in USA (a friend, a relative). Then I ask my friend to remove as much packaging as possible and also get rid of the invoice. She wraps the stuff as a present, she makes a new parcel and she adds some happy birthday cards or some other cards (depending on the occasion) in the box. The box is then shipped to me and I pay for the expenses and trouble via PayPal. When the parcels arrives, I have to go to the custom office to pick it up. Since the parcels come from USA (outside of EU) it's considered import and they have to open the box to check its contents. At this point they usually ask me what's inside to which I reply: I don't know... They said it's a surprise gift. You can also ship it to a friend working on a US military base in Europe. No customs, no taxes. I don't know but it's worth trying. It depends on how nice are the people at your customs post office. This way you can actually get the best deal on your GoPro or whatever else you wanna buy. I phurchase more stuff from non European Country and I can tell You that some times, even if You take the package like "gift" still pay taxe. One of recent example was on a package from China for about 185 $. I pay small taxe ..but still 15 € from my pocket for thoose thief. BTW..like You probably know..I live in Italy. It happens, man... I know. The bottom line line is to have the best cost even if you pay an import tax. Maybe it's time you start to question the VAT you're being charged. 24% VAT, thats more than excessive. Also, the increase in prices (E.U. v. U.S.) is due to the higher operating and compliance costs when you open an E.U. operation. Those costs as well as taxes are passed on to the consumer and reflected in the final purchase price. This is why, we in the U.S., see E.U. travelers coming here without luggage. It's cheaper to buy clothing and luggage here and return home with it. Customs never asks questions on luggage and clothes. Clothing is not taxed in most states and some U.S. states are 100% tax free shopping on all items. Yup - we have 24% VAT on all things here (Romania). That includes food and clothing. It's a non progressive tax which indeed burdens the consumer. (It was raised from 19%). Thumbs up for USA in terms on prices on consumer goods. You do have income tax which is pretty high from what I've heard. The income tax is tiered, 47% of the population is paying nothing at all in income taxes. Investment/retirement income is taxed at a lower level. I bought my gopro Hero 3 Silver edition online from a well known internet camera company .Price was £199 delivered to my door (uk).It was shipped from Hong Kong in 4 days and when i opened the box the invoice read its value was £30 !! !.